Darlings, your handbag collection may be brimming with noir satchels, laden with shimmering metallic clutches, even harboring a few charming yet oh-so conniving ravishing rouge pieces ideal for those instances when you feel the need for a splash of poppy color, or merely desire a lady in red moment. The shade of handbag that far too few of us own, however, is navy blue; the color synonymous with midnight. Thanks to the marvel that is Mimi Boutique, that is precisely what one (1) of you coquettish temptresses will be taking home. Café Fashionista has teamed up with Mimi Boutique to bring one (1) lucky lovely a Hermes Birkin-inspired Diana Satchel in Navy. Shrouded in faux patent croc leather, the Diana Satchel is a glamorous way to add a splash of sophistication to your look du jour - in addition to pleasing your ever-burgeoning arsenal of accessories! ♥For one (1) entry, leave a comment on this post stating what Mimi Boutique item is your favorite between now and Friday, October 8, 2010 at midnight PST. ♥For two (2) entries, Twitter about this giveaway, and leave a comment on this post stating what Mimi Boutique item is your favorite between now and Friday, October 8, 2010 at midnight PST with your Twitter URL. ♥ For three (3) entries, become a follower of Café Fashionista on Blogger/Google Reader/Google Friend Connect/Twitter, and leave a comment on this post stating what Mimi Boutique item is your favorite between now and Friday, October 8, 2010 at midnight PST (if you are already a Café Fashionista follower, please say so in your comment). I will randomly pick one (1) name out of a hat (who knows, it could be yours! ), and announce the winner on Saturday, October 9, 2010. Thanks to Mimi Boutique for the picture. Gorgeous bag! Mimi Boutique has such a great selection. I think the tan Camila bag and grey Kirsten bag are perfect. I love the Mulberry-inspired looks! Oh my gosh what a great place! 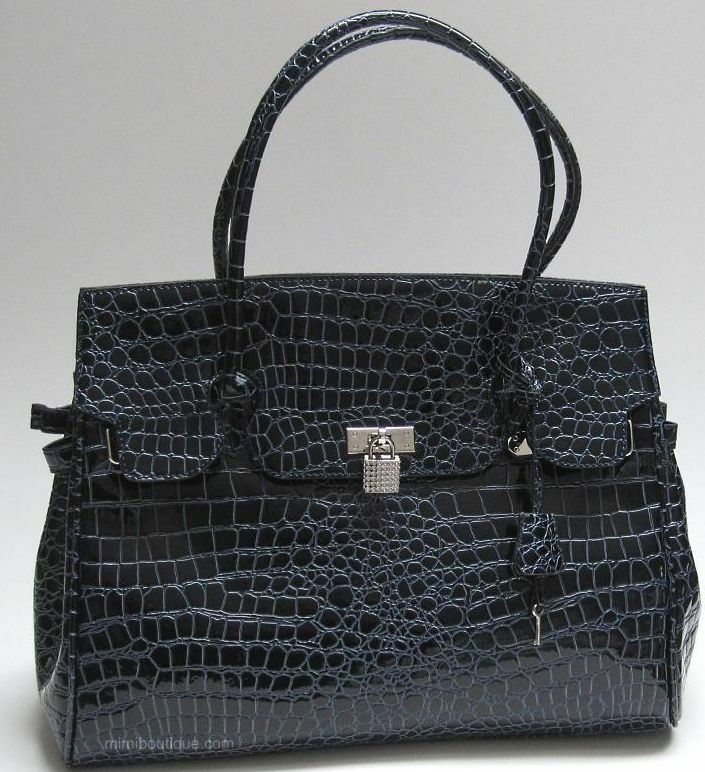 I love the Paulina Python Accented Satchel! Not from the U.S. but what a fab giveaway. Happy Weekend! Natalie Tan Hobo bag is delightful. There are so many pretties, but the Camila Bag (in the Taupe color) has name written all over it! My favorite item is the : Kirsten Bag in Grey ! I love the Paula Padlock bag from Mimi Boutique! I also retweeted about this (SciHousewife). I love this giveaway! I think I have fallen in love with the Duval Stud & Rhinestone Tote! I am a follower on Blogger and I tweeted about this giveaway! I'm drooling over this bag! Wow, awesome giveaway! I like the Jolie Studded Satchel in Cognac Tan. I love this bag-- so classic!-- but my fave is the Justina... in any color! Oh, and I follow through Bloglovin'. It's not not quite Google whatever, but I do. I am loving the Absolute Messenger bag in Black. It is so killer. I hope you're having a good day. ok i am obsessed with this bag!! but i also really like the jackie bag in grey. i have been searching for a perfect grey bag and that may be it! thanks for all the amazing giveaways you do! Great site. I love the 'Chain Reaction' necklace! So true, Erika! I don't have any handbags in navy and I'm dying for one. This one is gorgeous! I also love the camilla bag in tan. So pretty. My favorite item is the Cameron Cameo Brooch in Black (http://www.mimiboutique.com/jewelry/cameron-cameo-brooch-in-black.html). I love love love cameo jewelry and am so excited to see it becoming a new trend! What a wonderful give away! Love this bag. The Camila Bag in Tan is my favorite. I follow on twitter. The Alyssa Grey Flower Satchel is dreamy! Discovered this blog today, and am promptly adding it to my Google Reader! Sounds like a great giveaway! I love the Camilla Bag on their website! OMG. Their feather hairclips are OTHERWORLDLY. I am particularly fond of the Melissa Fuschia and Tan Peacock Feather Hair Clip. I love the Mandy Butterfly Bracelet. I love butterflies and the tones (Gold, Silver, Pink & Clear) are swoon worthy and perfect for my wedding motif. i am already a follower. and i luv the kirsten bag in grey. I dig it! I dig it so much, I re-tweeted it. I'm also a follower of your awesome blog. If you pick me out of the hat, I choose The Absolute Messenger Bag in brown. Thanks to you and Mimi boutique. I dig it! I dig it so much, I re-tweeted it. I am also a follower on your awesome blog. I dig it! I dig so much I re-tweeted it. I am also a follower of your awesome blog. If you pick me out of your hat, I choose the Absolute Messenger bag in brown. Thanks! wow, what a fab give away. So great. Love this bag you are showing off in the post. I love it, the colour is great! So it's such a loss I live in Holland... Maybe next time! I love all of the vintage jewelry headbands on the site, especially the one called Raina! I love the Jackie Bag in Grey! I am a follower on Google Friend Connect - Lydia A. Favorite bag is the Nilo Satchel with Chain...new favorite blog is this one! Just became a follower. Thanks for the giveaway! Great giveaway. I love the Jenna Black Leather and Crystal Strap Bracelet! It's the Rocker Chic in me! The Blanca Bag in Black is terrific! I really want to win an attractive bag for my mother in law.She is wonderful to me and she really needs a new purse.They one she has in just rags,and she keeps saying she wants a new purse. I am already a gfc follower and probably follow you in every way there is already. Have a wonderful week and thanks for your fabulous giveaways and always the easy entries. You have to love a classic like the The Absolute Messenger Bag. In brown, it's definitely my favorite. Contessa Black Bag is a nice purse.My wife complains she needs a new purse.This one would be a nice one to give her. My favorite is the mustard yellow wallet! Favorite item is the mustard wallet! love Pamela Leopard Stretch Bracelet! I love the bag you are giving away! Very classic and yes I am of course a follower! Have a great Wednesday!! Im already a follower of your awesome fashion blog! After searching through Mimi Boutique I found that my favorite item was the 'Josephina Turquoise Clutch'. If there were a matching larger purse, oh boy, I would be in heaven. I would use the clutch for nights out and the bigger bag for lunch out! Put me down for all three entries. can't get enough of the feather headbands -- the fiona purple feather headband is my favorite! My favorite bag is the Camila bag! I adore it! I'm now a follower on google reader! I'm a fan of the red python birkin inspired satchel. I follow via GFC, I RT'd (http://twitter.com/#!/butterflyrouge/status/26677583441), and I love the Amy Lavender Hobo bag at Mimi Boutique! I like the Camila bag in the taupe. Could be the most interesting topic that I read this week?! ?